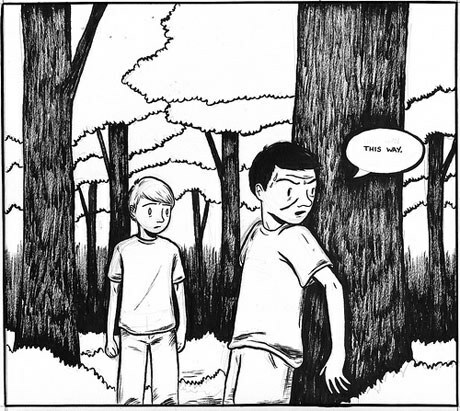 The forest in Sean Ford's strange and beautiful graphic novel is a vast, intimidating place. A once-serial comic now collected in a nearly 300-page black and white book from New York City-based publisher Secret Acres, Only Skin is set against a simple, recognizable American town. There's a post office and a diner. Members of the community amble about, fill up at the local gas station, and nod knowingly at each other on the empty streets. At night, they experience strange dreams and file into council meetings to sound concerns about neighbors who have recently gone missing in the woods. Only Skin's "Spӧke State Forest" is an integral piece of a story that melds horror, dream-state hallucinations, and rather weighty emotion, be it the brand that clarifies familial love or the kind that drives local politics-rooted dialogue into volatile shouting matches. Most of the characters' outbursts materialize in conversations about the forest. Only Skin's woods are worked into six of the book's first seven panels. They're visible just ahead of a mountain range -- a set of black hills and soft, rounded peaks. Creator Sean Ford's uniform trees are a minimal visual, an array of twigs in the distance with cotton-like puffs of leaves resting atop their limbs. For Ford, Only Skin's wilderness has spindly roots in the soil near his Connecticut childhood home. He recently spoke with comics journalist Tom Spurgeon about the woods that terrified him as a kid and the "raw and primal" value that's worth exploring beyond the trees. For me, the forest in Only Skin evokes the overgrown end-of-the-cul-de-sac where I spent most of my youth. Five houses to the south of my parents' home in Pennsylvania, a patch of woods played a major role in our lives during the sticky summers of the late 1980s. My mother cited barbaric local news stories to support her argument for keeping us out of those woods, and I caught wind of the murders, kidnappings, and worse that were set in wooded areas all over the United States back then. It was all part of the appeal for us, though. We had BB guns, tree forts, and a creek that we followed for miles to a lake on early Saturday mornings. We sneaked cigarettes, burned piles of leaves, and drank piss-warm beer that neighbors had stashed away under the cover of plastic shopping bags and rain-soaked newspapers. We threw dirt and flipped over rocks in the stream to find crayfish. We knew the woods well but we really didn't, and when we rode our bikes along partially cleared trails that led there, sometimes we had to pedal very quickly on the way out. And save for the games of flashlight tag that grazed the poison ivy-dotted border of those woods, we sure as hell weren't in there when the sun went down. The forest in Only Skin harbors its own secrets, as a young woman named Cassie and her brother Clay return to their small western town to look for their father Sam, who has gone missing after heading into the woods a week previous. The warnings from locals are immediate -- the vast wooded area behind Cassie's family's gas station should go unexplored. "What? I'm not sure that's a great idea," says Chris, a mechanic who worked alongside Cassie's father before he went missing. The forest in Sean Ford's strange and beautiful book is an intimidating place that locks in most of Only Skin's murkiness. The book's dreams and intangibility mystifies, too, in the townspeople's odd nightmares or generally inexplicable experiences. For one, Chris's sense of the present is hazy. He's barely lucid at points, a narcoleptic, dozing off mid-conversation or napping in the garage at particularly unstable junctures of the story. The mild-mannered Paul dreams about his father's brain disorder, a scenario that takes place in a hospital before Sean Ford plants the bed and IV bags in a grim forest setting, where Paul's dad is drawn walking off into the trees. 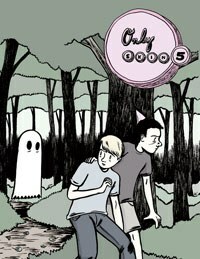 And Cassie's brother Clay begins a regular dialogue with a ghost, the iconic Halloween-clipped-sheet-n'-eyeholes apparition you've always known but have never really been comfortable with. Their conversations begin when Clay appears to be asleep, and then suddenly outside, in the infinite Spӧke State Forest. Only Skin's oversized pages (8.25" x 11") offer a roomy canvas for Ford's sketch pens. Blacked-out night walks in town are barely illuminated by streetlamps and sunlit scenes have the spacious panels they call for. When Cassie gets back into the old neighborhood, she finds Chris talking to a cop and cleaning up a ghastly, bloody scene that transpired in the station's lot. By the time she starts asking questions, a number of people have disappeared into the woods. From that point, even in its familiar framing and infrequent spots of dark humor, moments of certainty or comfort are scarce in Only Skin. "There's a lot of territory out there..." says Chris. Sleepy or not, he means it. Sean Ford's 'Only Skin' is available now from Secret Acres.